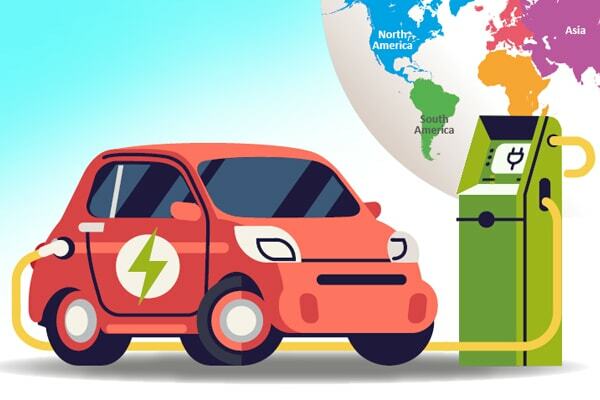 As the world gears towards an all-electric future, automakers around the globe are laying the foundation for improved charging infrastructure to enable the mass adoption of electric vehicles (EVs). We dive into the emerging charging technologies to watch for and the companies that are leading the charge in EV innovation. Automotive industry standards classify charging stations into three levels based on charging power and methods: AC Level 1, AC Level 2, and DC Fast Charge. AC Level 1 is the slowest form of charging that uses a standard household outlet (120v). It provides a range of up to 5 miles per hour and is, therefore, not suitable for those who travel more than 40 miles a day. AC Level 2 charging uses EV service equipment to provide power at up to 240v. It provides 10-25 miles of range in an hour of charging at home or at a public station. DC Fast Charge is currently the fastest type of charging, providing up to 40 miles of range for every 10 minutes of charging. These stations are expensive (up to $100,000) and require more power than to electrify your house. Major automakers and technology providers are betting on newer methods of EV charging, which could increase adoption and lower the cost of EVs. Ultra-fast charging networks: BMW Group, Daimler AG, Ford Motor Company, and Volkswagen Group with Audi and Porsche have joined forces to create an ultra-fast (350kW) charging network in Europe. The goal is the quick build-up of a sizable number of stations to enable long-range travel for electric vehicle drivers. With this solution, consumers can expect 240 miles of range with 15 mins of charging. This will be an important step towards facilitating mass battery electric vehicle (BEV) adoption. Autonomous park-and-charge: Volkswagen, in collaboration with six partners, is pushing the development of V-Charge – an EU research project that is focused on automating the parking and charging of electric vehicles. V-Charge automates the process of detecting a parking spot and charging through a dense network of sensory devices, including four wide-angle cameras and two 3D cameras, twelve ultrasound sensors, digital maps and the ‘Car2X’ technology for the vehicle’s communication with the infrastructure. Wireless charging: Nearly every electric car manufacturer has plans to offer wireless EV charging. Aftermarket solutions for wireless charging already exist and are offered by companies, such as Plugless, WiTricity, and SemaConnect. These technologies are also being licensed to car manufacturers, such as Nissan and Toyota to provide wireless charging as a built-in feature. Dynamic Electric Vehicle Charging (DEVC): Embedding EV charging technology under the road surface could soon be a thing. In this type of charging infrastructure, an EV gets charged when driven over transmitter coils embedded under the road’s surface. These are likely to appear first on buses or delivery trucks running on fixed routes. Companies such as Qualcomm and Israeli start-up ElectRoad have announced successful tests of dynamically powering vehicles while they are in motion. Solar roofs: Charging models that involve the integration of electric vehicles into the energy systems with a high share of renewable energy sources (mostly solar and wind) are being developed. Panasonic launched a solar roof for the Toyota Prius Prime plug-in hybrid in Japan, which is said to be able to supply power to its main battery pack and add a few extra driving miles. Analyzing patent trends can help identify the companies that are leading the innovation and development in a particular space. 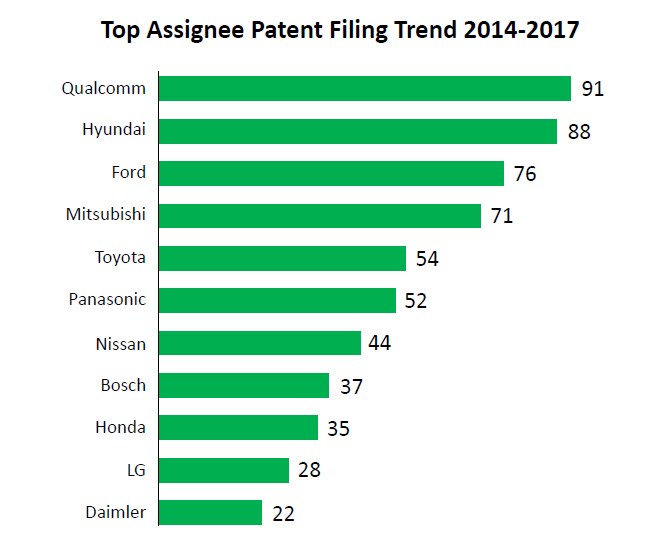 Based on the patents assigned between 2014 and 2017, we observed that Qualcomm is leading the race in the development of EV charging technologies. It is followed by Hyundai, Ford, Mitsubishi, and Toyota. Qualcomm patents focus on dynamic electric vehicle charging (DEVC) technology. The company has licensed its wireless charging technology for electric vehicles to automotive parts manufacturer Lear Corp. Ford has offered its patents for licensing owing to increasing adoption of electric vehicles and the underlying infrastructure. Toyota’s patents focus on fuel cell technology and aim to improve the infrastructure supporting fuel cells by creating more hydrogen fuel stations. Despite the obvious benefits electric vehicles offer, they are currently far from attaining mass adoption and becoming economically viable for automakers. As the adoption of EVs largely hinges on the availability of better-charging infrastructure, it’s going to be interesting to see which companies succeed in providing the best charging solution for consumers. To learn more about the latest developments in the electric vehicle technology space, reach out to us at [email protected].